Wow, Darlene, the mysteries of the universe are easy, but this real life stuff is hard isn’t it? On the other hand, if we can’t come up with good solutions to every day problems, maybe this is an indication we don’t have all the answers to the higher stuff either, but we do our best. One thing the child care books all leave out is that when you bring the kid into the world you are really bringing in an entity who is a very ancient soul and has been conditioned by many lifetimes. He or she will have many characteristics that are very set and will be difficult to influence or change. In any relationship there will always be many items in the other person that we will just have to accept if a peaceful relationship is to be maintained. Now if you have a child who was an absolute monarch in his last life he will come into life with a strong attitude that he is to have his way in all things and that he does not need to lift a finger to help. On the other hand, if your child was an obedient slave in his last life he may be quite easy to manage and be very helpful in this life. Because each soul is uniquely different it is difficult to come up with a one size fits all for the guidance. Thus the best parents are those who are full of love and understanding, yet have the common sense and judgment to set a course of discipline and guidance geared to the personality of the child. The first thing to do with a child is to start at day one assessing him or her and influencing the little life in a positive direction. The greatest lack with today’s child rearing is discipline. 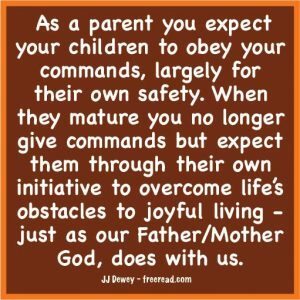 Now we have talked about just and unjust authority, but a parent does have a natural and just authority over a child and should establish that from the beginning. Until the child learns to understand language that authority should be established through love and nurturing. If the child feels such love from the parents he will almost see them as gods in his infant mind and develop a willingness to please the parent in any way possible. This lays the foundation for positive and effective discipline later on, for if the child has a bond of true love with the parents he will have a natural desire to please them. When the child obtains the power to communicate and understand then the parent needs to establish black and white rules geared to his temperament. Now, overall we have discouraged black and white attitudes, but clear cut rules are necessary with children because of their thought process. Few children are able to use a lot of discernment and judgment, making clear-cut easy to understand rules necessary for their comprehension and learning. Thus for a child the rules need to be laid down as soon as they can understand what a rule is and the breaking of such rules needs an easily understood punishment that must always follow if the rule is broken. Then after the punishment is applied the parent should show an increase of love. If the child obeys the rules he should be periodically praised and rewarded, even if the reward is a small thing. Here is a principle of supreme importance in raising the child. ALWAYS, and I mean always, keep your word to him or her. This is especially important concerning punishments. If you tell the kid that if he is late he will be grounded and then you feel sorry for him when he pleads and you let him out of the punishment this sets the stage for complete breakdown of authority and discipline. No matter how bad you feel about keeping your word or how heart wrenching it is to carry it out, carry it out anyway. If the child knows for sure that you will do what you say he will respect you and when you say “do this or XYZ will happen” he will be diligently obedient to avoid XYZ. Then there are mild mannered children by nature that will not need a threat of punishment if the relationship is good. To such a one you may merely have to request “would you wash the dishes?” and it will be done. To many of us this would be a dream kid and it is the source of irritation to parents to encounter a parent with such a dream kid who thinks that no discipline is necessary in child raising. Little do they know how lucky they are for the kids who were a king or queen in a past life will definitely need a strong hand and consistent discipline in this one. If love/discipline/consistency/obedience become a habit with parent and child even the most difficult of children will turn out to be fairly cooperative. Now this process usually works well if you have the child from birth, but what if you inherit some child through marriage who is over eight that is completely out of control? Or what if you just have not established the right patterns with your own child, but want to start now, even though he seems hell bent on becoming the antichrist? Such a project is indeed one of the most formidable goals one can undertake in any life. If you are undertaking such a project the first thing you must realize is that complete success is very unlikely with such a late start, but if you work on the most important things you can lay the foundation for successful lessons to be learned after he goes out on his own. The advice for the out-of-control older child is the same as with the young one with one exception. When starting from scratch with a newborn you can expect positive results in many areas of life, but when starting late with a difficult child even a small improvement in one area is to be viewed as a significant success. Here’s my line of approach with the problem child. Pick the one thing about the child that may be possible to change that would produce the largest possible benefit. When you decide on this one thing develop a plan to materialize it and put a large part of your energy in this direction. Other teaching opportunities are not to be ignored, but keep this one item as a main focus of attention, always remembering the power of Decision and then focusing Attention on that decision. Let us say that the kid has no concept of the value of a dollar and seems to think that everything he wants is to be given him on a silver platter. This attitude will put him at an extreme disadvantage when he leaves home and enters the “real world,” so you decide to work on this. Now whenever he wants something that costs money you give positive reinforcement that he can obtain anything he wants, but the way to get it is to earn the money. Therefore, you make him do some work for every dollar you spend on him (beyond necessities). Many parents give in to this reasoning and then years later wonder why the kid keeps maxing out on credit cards and wants to borrow from Mom and Dad. You must not give in here. Instead, teach the child that he earn the money first and then buy. This is a lesson I wish my parents had reinforced in me. It would have certainly made my life easier. If you maintain your stance and the child really does want the game he will, after a period of complaining and pouting, come to you willing to do some work. Then when the kid does do some work dock his pay if he does a haphazard job. Make him do the job as agreed before you pay him. This will be an extremely important lesson that will carry over with him in the real world. Now let us say you have achieved, after a period of time, some success with this first goal. Once you are satisfied that the child has learned a lesson here pick another main lesson for him to learn. Maybe you’re catching him telling a lot of lies and now correcting this becomes the new prime focus. If you can teach even one or two important lessons to the problem child he will see the value of them when he goes out in the world away from Mom and Dad. As the value of what you have taught him begins to register then he will naturally gravitate to you for more advice as an adult. When this happens it becomes possible that the joy of cooperation that you seemed to miss with him as a child now becomes a reality as an adult. It would take volumes to cover this subject, but I hope my general direction here is useful. To say that we are ahead of the Christ himself to the extent that we need no protection of deliverance from evil is quite a leap. I try not to put myself ahead of the Master, but apparently there are some that do. Jesus went on to practice what He preached and later told Peter that He was concerned about him and prayed that he would be protected from evil so he could be successful. I have met quite a few people of both philosophies here, but have never met a person who sees no need for protection who has accomplished much more than dreams of glory. I know one guy who thinks he is the Lord of the galaxy incarnate and he sees no need of protection of any kind. On the other hand, every single historical person I can think of who has accomplished good in the world has seen the need for protection in one form or another. Such initiators are not afraid of fear and can use all the words of both polarities in a positive way. Those who believe they are there (in the ultimate reality) and not here (in the dualistic reality) are obviously not going to change their minds. I’m bound to make more comments on this subject as it seems to come up again and again, but I’m sure that the majority of the group (an unscientific assumption) would like us to move on to other teachings.